If you are a true horse racing fan and bet on Kentucky Derby, you would probably want to make a trip to Churchill Downs at some point in your life. Think of it kind of like a pilgrimage, as it were. Sure, you can bet on the Kentucky Derby odds and watch from home, but being there is a completely different feeling. If you know about the race, that also means you are familiar with the twin spires that are as much a part of Churchill Downs and the Derby as frosty mint juleps, the garland of roses and betting on Kentucky Derby. The twin spires are a part of the logo for Churchill Downs, so that gives you a sense of how important it is to its culture and history. First, you should probably know what a spire is. A spire is a tall cone-looking tower that is usually on top of a building. Think of the large cones you see coming from the top of a church. That is a spire. These have been around since the 1300s or so – possibly earlier – and they were created to give off a sense of power and strength. The tallest spire in the world is currently located in Australia on the top of the Q1 building, which is the tallest building in the Southern Hemisphere and the fifth-tallest residential building in the entire world. The twin spires were created in 1895, about 20 years after Churchill Downs was built. Colonel Meriwether Lewis Clark Jr had to sell the track to a group of investors led by William Applegate with William H. Schulte as president. One of their first orders of business was to build a new grandstand to create more revenue and make Churchill Downs a real power in the world of thoroughbred horse racing. For this, Applegate and Schulte went to Joseph Dominic Baldez, who was only 24-years-old at the time when he got basically the job of his life through his employer, DX Murphy and Brother, Inc.
Baldez has stated that when he was coming up with the original design for the grandstand, there was nothing about the spires in the plans. They were something that just felt right and he turned out to be 100% correct. Speaking of 100, the job was reported to have cost around $100,000, which doesn’t seem like a lot right now but it was a fortune at the time. Some also say it cost closer to $50,000 and the higher price was thrown out there to give it a greater sense of importance. Either way, it would probably be a multi-million dollar job in today’s times. Dubai would definitely have to attempt to build a larger spire or building as they did to the Q1 building. The twin spires were ready in time for the 21st running of the Kentucky Derby on May 6, 1895. There were some who were doing their Kentucky Derby betting that felt the spires were an eyesore but overall, they were well-liked by many visitors to the track. Most people were impressed by how it made Churchill Downs look including the state of Kentucky. They grew proud of the structure as it helped make their race look even more prestigious at a time when they already considered themselves the leaders of high-stakes thoroughbred horse racing in the United States. Matt Winn, former president of Churchill Downs and the man who is really given credit for turning the Kentucky Derby into the spectacle that it is today, told Baldez that the twin spires would never be taken down. So far, so good. One fun fact to chew on: even though he was responsible for creating the most loved part of arguably the best track in the United States, Baldez himself never attended a single Kentucky Derby, although he did go on other days. The reason? He felt responsible for the twin spires and if something happened to them, like they collapsed and caused a big tragedy, he wouldn’t be able to handle it. Needless to say, Baldez, who died in 1957, never had to worry about anything and the twin spires continued to lord over Churchill Downs to this day. One more nugget: in 1995, on the 100-year anniversary of Churchill Downs, there was a time capsule buried in the spires to be opened in 2095 for its 200th birthday. That is going to be some occasion, possibly the biggest day in the history of the racetrack up to that point. 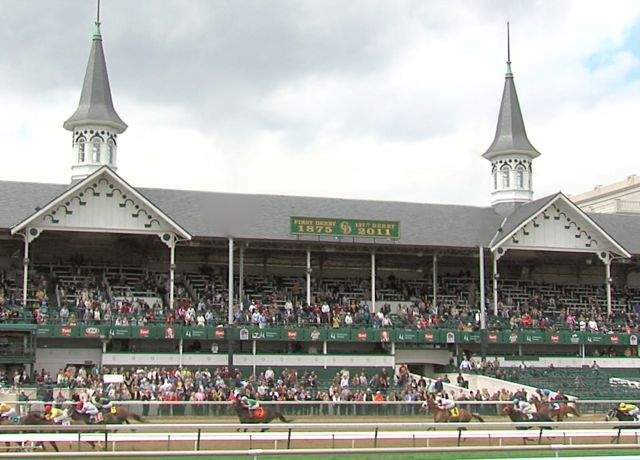 Plans for renovations to the grandstands at Churchill Downs came to light and they were started in 2001. The renovations took four years to complete, finishing up in 2005 and they cost $121 million in total (give or take). There were a few new luxury boxes added and an artist was commissioned to create a mural with all 96 Kentucky Derby-winning jockeys included. The Kentucky Derby contenders weren’t all included in the mural; only the winners were. There were many other renovations done to Churchill Downs but one thing that was not touched were the twin spires. Actually, they were just spruced up but nothing was changed to the original design as Baldez had created it. The twin spires were over 100 years old and it was the smart thing to do to help keep them preserved. That turned out to be shrewd planning as Louisville, Kentucky was hit by a tornado in 2011, although it was only an EF-2 (the scale goes from 1 to 5, with 5 being the highest). The stables were hit by the tornado, but no horses were lost and there was a surprisingly lack of damage. The twin spires weren’t hurt at all. Not only do they give off a sign of strength but they actually proved to be quite strong as well. Following the renovations, one major concern was that the twin spires would not be visible from every part of the track. It is an especially cool view when the horses are racing down the backstretch toward the finish line. However, that proved to be a non-issue as the spires are seen perfectly fine.